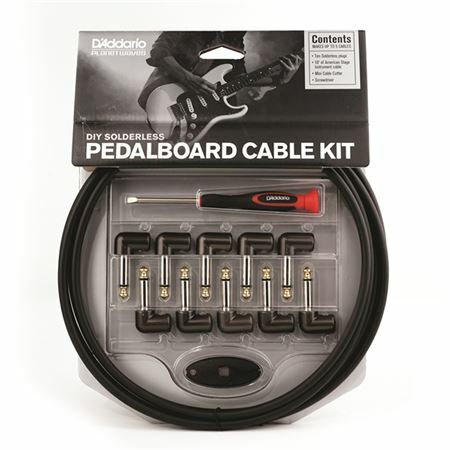 Shop DAddario DIY Solderless Pedalboard Cable Kit from AMS and enjoy Fast & Free Shipping. Love it. Solid connectors. I can put my pedals in convenient places on my pedal board, not just in the correct order. Best solderless cable ever had!!!! Great signal very easy to work with. Worth the money I paid for. Incredible solution to everyone's pedalboard wiring! As a professional musician I travel constantly. There's nothing worse than getting to a venue, unpacking the pedalboard and spending an hour rewiring, re-twisting ties to keep cables together, etc. With the D'Adarrio DIY Solderless Pedalboard Cable kit I was able to build exact length patch cords in less than 20 minutes. Every gig I'm at now the soundman, etc, come up and say it's the neatest, cleanest laid out board they've ever seen. Well worth the investment which I consider extremely cheap for a permanent solution. Bought two more kits and all 5 of my pedalboards have that exact same neat, clean layout that stays together regardless of how rough the trip! I have only made a couple cables and they seem to be doing there job. No added noise and the cable is a a nice size. My board is all George L’s and these are working fine. This was bone-head simple. After looking at other options where you have to strip the wire or peal back layers, I decided to try this D'Addario kit. I've read comments on other products that said that you spend a lot of time redoing the connections because they don't always make good contact. Well these all worked on the first try. They've only been on my pedalboard for a few days, so we'll have to wait and see if they hold up, but so far, so good. The mini cutter works great and the included screwdriver even has a magnetic tip which is handy for the little screws. Unless they start failing on my board, I'll buy more D'Addario Planet Waves cable kits and components.